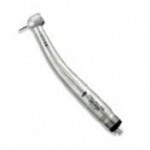 NSK has performed a great service to young dentists with the NSK Pana series handpieces. Using the exact same turbine technology as in handpieces upwards of $1000, NSK offers a low cost, no frills handpiece with pushbutton chuck that will actually perform for a year or two before needing repair. And, just like it's big brothers, the NL 85 and Ti-95, the NSK Pana Max handpiece offers a chair side replacement turbine which incorporates the clean head system, adding to its longevity. Without a doubt, one of the very best entry level handpieces on the market at $300 and change. New dentists can buy 5 NSK Pana handpieces here, and bring costs near the unheard of level of $200 each. It appears these dealers are serious about competition.